bringing out the deepest possible color is a measure of the cutter's skill. The pink color of fancy pink diamonds is actually a light red. Different tone levels of pink can be thought of as similar to the colors achieved by gradually adding water to a red paint. When brown or orange overtones are present, the purity of the red is lost and the color's beauty is diminished. A major cutting consideration for many colored stones and fancy-colored diamonds is the zoning of color in the rough material. Many fancy-colored diamonds are polished into fancy shapes rather than round brilliants in an effort to minimize weight loss to the rough material, while simultaneously making the color appear as deep as possible. The cutter's skill is measured by his ability to make the diamond's color appear as deep and beautiful as possible when viewed from above. As long as imperfections do not severely affect the beauty of the stone, color is considered more important than imperfections when establishing value. The fancy pink diamond shown below is from the Argyle mine in Australia. Discovered in 1979, Argyle began commercially significant production in 1983. Large-scale development has continued since, and by 1995 the mine accounted for 40 percent of total world diamond production. Yet because most of these diamonds are of low quality, with many brownish diamonds, Argyle accounts for only 5 percent of world production in monetary terms. Of the diamonds mined at Argyle, the rare fancy pinks are the most important. Only small sizes are found there, rarely exceeding 1.5 carats before cutting, but these stones have had an immeasurable effect in raising consumer awareness of fancy-colored diamonds since the 1980s. The Argyle material has a characteristic purple-pink color with strong bluish overtones. 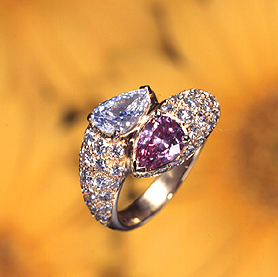 Although the fancy pink diamond as shown in the photograph on the next page is light in color, it has a beautiful "cherry-blossom" color. The balanced pink and white mosaic pattern seen in this photograph exemplifies the beauty of fancy pink diamonds. This diamond's precise source cannot be determined, but it is probably from India, Brazil, Tanzania, Zaire, Angola, Russia (the Arkhangelsk mine near the Finnish border), or the Premier mine in South Africa.